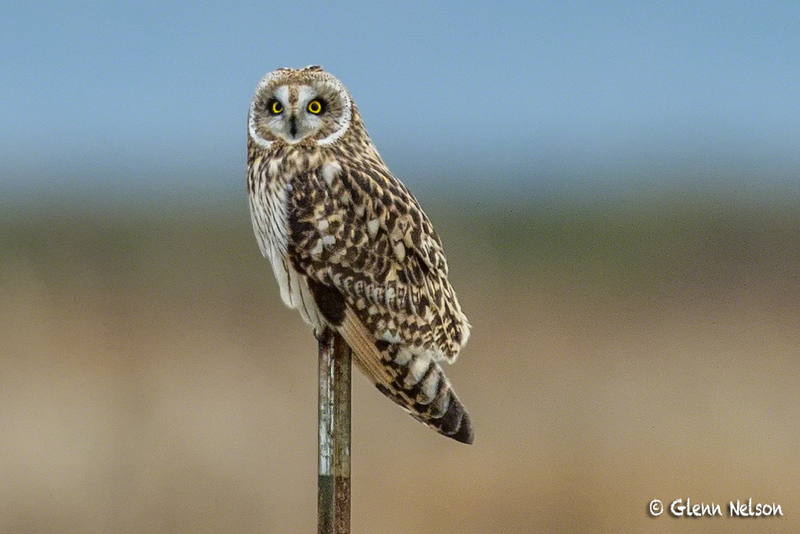 A Short-Eared Owl on Samish Flats. For some reason, the Short-Eared Owl has been fairly elusive photographic quarry for me. I’ve now been photographing birds, off and on, for almost a year now. I started with a class in Padilla Bay from my friend Paul Bannick, during which one of the participants mentioned this curious bird. From that moment, I was determined to photograph one. I returned almost immediately to a spot in the Samish Flats, about 75 minutes north of Seattle, that is managed by the Washing Department of Fish and Wildlife and to which birders refer as “West 90.” No luck, though I was told they were “abundant” there. Another birder/photographer told me the Short-Eareds were so omnipresent at Rawlins Road, near Fir Island, it almost wasn’t fair to photograph them there. The day I went, they must have taken a holiday. (NOTE: Clicking on an image will reveal a full-sized version in a separate browser window). The first time I saw a Short-Eared Owl was in March, when I stopped at West 90 on a whim after visiting with my daughter on Whidbey Island. That day, I’d forgotten my teleconverter, meaning, gasp, that my reach was limited to my 500mm lens. I watched the Short-Eared fly around, noted that it liked a certain perch, and tried to approach. After spooking it a couple times, I half-hid behind a bush and waited for it. Just as it returned, my cell phone buzzed and I looked down momentarily. When I returned to my viewfinder, the owl was gone. 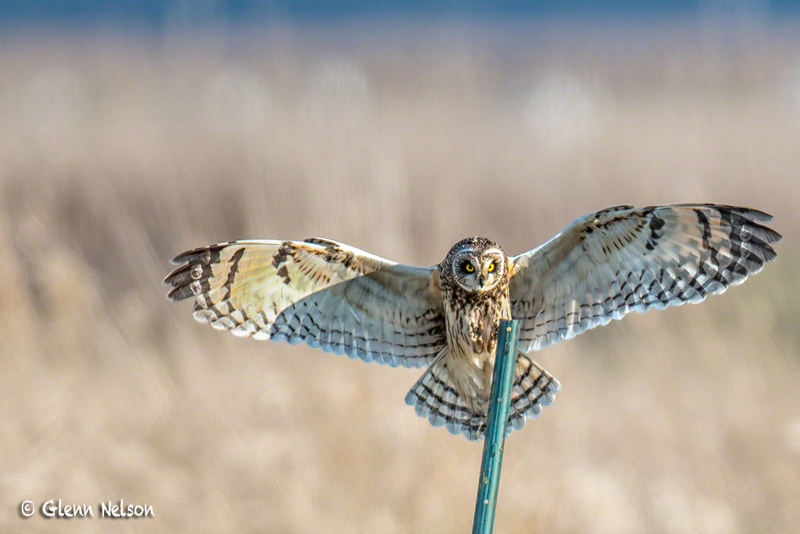 A Short-Eared Owl landing at Samish Flats. I was crushed. However, when I checked my images later, there was this one. Apparently, I must have been pressing the shutter without it registering. Last week, I started a hawk identification class from Bud Anderson of Falcon Research Group, which inspired me to head back up to West 90. But I was distracted by the massive flocks of Snow Geese. Then I made one of my favorite stops, to Bow Hill Blueberries, which is owned by my friends Susan and Harley Soltes. By the time I reached West 90, it was almost dusk, which meant I had little time to photograph. Fortunately, I immediately recognized the distinctive, almost stiff-legged, choppy flight of two Short-Eared Owls. One perched just a few hundred yards away on a fence post and remained while another photographer and I approached, then abided us as we snapped away for several minutes. The other photographer moved on, but I remained, betting the owl would return, which it did. Distracted by a hovering Northern Harrier, I missed the actual return, but I had moved in closer and got the lead image, which shows enough detail that you can the little tufts of feather that look like “ears” on the top of the owl’s head. This is not my ideal, but it’s a step closer and was a shade easier. Next opportunity, I’ll bring more time and focus – two ingredients I now know are essential in this quest.